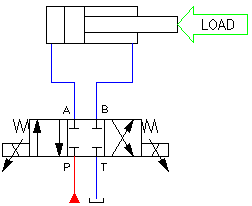 Here you can find the online calculations for Pump-Motor in close loop. These calculations are for variable displacement pump and fixed displacement motor. These calculations can help you to estimate the pressure losses, and flow velocity in the conduit (hose, pipe or tube) and check/correct conduit ID. The recommended flow velocity in conduits you can find at the article Recommended flow velocity. The assumption: pressure losses on elbows, fittings at calculated conduit is zero. Height difference between IN and OUT points needs to calculate hydrostatic pressure what will be added to pressure losses, if IN point is below OUT (use positive value), or subtracted from pressure losses, if IN point is upper than OUT (use negative value). Use value “0” if height difference can be neglected. Darcy equation – for laminar flow. Churchill’s all-regime (1977) – the best approximation what I found for critical and transient flow. Haaland’s approximation (1983) to the Colebrook–White relation – for turbulent flow. These calculations can help you to figure-out conduits (hoses, pipes or tubes) parameters (ID sizes, piston speed, flow velocity and cylinder’s force) for any qty of cylinders connected in parallel circuit. The assumption: Pressure and Return lines conduits (flow source – flow divider and flow divider – tank) have the same ID size. 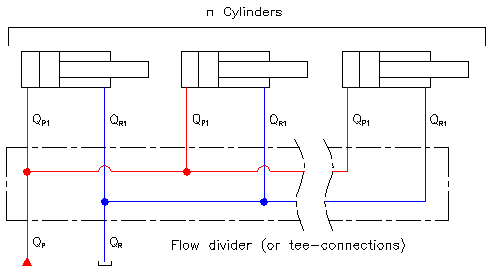 The assumption: the conduits between flow divider and cylinders have the same ID size. The formulas and algorithm of calculations you can find by this link. Pressure compensated pump with variable displacement is used as a source of pressure and flow. The spool lands work as orifices and have the same shape on both sides of the spool land. The same orifice coefficient (Cv) is used for both lands. Here you can find the online chart which let you easy adjust any flow or pressure valve using its settings range and the available number of turns.